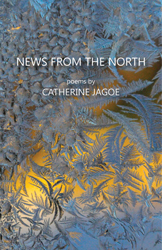 First published in North American Review, 296.1, Winter 2011. Appears in News from the North. it sipped a slow rain of plankton. its age, counting its rings like a tree's. was that the clam died. for the invention of barbed wire and GM corn. window sashes in the clapboard houses. where I live now, scouring all beneath. Just west of here, it stopped. views, variety, a sense of perspective. but fails to fix the trammeled drain. he's gone back to the drink. live forever, lets us die. I know Tylenol and temperatures and loose teeth. I know mounds of corn snow and blebbed ice. the humdrum life of school. the cold, the hidden muscle. I know a slowed heart. I want marigolds and mangoes. on the airfields and the valleys opening. I want woods full of bluebells. Moel Siabod, Cadair Idris, Tryfan. I want Reit dda (Fine, thanks). I want figs and custard apples. and lemons on the trees. called "Birth of the River World." to tell me, belting out "Cwm Rhondda"
everything to be yellow, orange, red. All winter, I cook foods from abroad. till caramelized. Grate ginger root. gale force eight, occasional showers, rain. the mountains bleak and shrouded. with their secret, iridescent insides.